Campaigners opposed to a new housing estate on the foot of the Eildon Hills have reacted furiously to new plans to increase the number of houses on the plot even further. Rural Renaissance, the contracting arm of Melrose-based JS Crawford property developers, wants to build 28 homes on the Croft, near Dingleton Road, Melrose. The firm has been locked in discussions with Scottish Borders Council planners and the public since the plans were first unveiled in October 2018. Following a public consultation last year, the number of houses was reduced to 21, but now Rural Renaissance has submitted redeveloped plans for 28 houses on the site. The development, if approved, will circle around the existing nursery building there. The original application states: “The approach to development will be sympathetic to the local area in terms of density, scale and massing; being consistent with local planning policy to create a development that contributes to the local environmental quality. Since October 2018, Scottish Borders Council has received 118 objections to the plans, and Melrose Community Council has also written to the council, outlining the concerns of residents. Campaigner Greg Simpson, who runs the ‘don’t build on the Eildons’ Facebook page and lives on the nearby Douglas Road, said: “This new submission is worse in that there are now more houses, an increase in density from 26 to 28 houses, which is more than the council planning brief allows. “The new landscape proposals show detail levels so we can now assess fully the impact of the large houses planned for the elevated south and eastern boundary. “These proposed new houses will be a full 15m higher than the eye-line from the road, imposing and dominating the landscape. “Fifteen metres is more than four double-decker buses. The Hollywood sign in Beverley Hills is only 14m. It’s going to be sticking out of the Eildon Hills like a sore thumb. “All of the ridge levels of the houses will be four to five metres above the Croft. “They’ve also had to admit that they got the traffic survey seriously wrong. They’ve had to alter the number of vehicles they expect on Dingleton Road to more than five times what they first expected, as they hadn’t counted the toing and froing from the Croft nursery at rush hour. “They had thought there would be 30 traffic movements at peak times, and they’ve now had to admit that there will be an extra 150 traffic movements in that area. A spokesperson for Crawfords highlighted the economic benefits of allowing the proposals to go ahead: “The proposed new homes at the Croft is an exciting project for the local community. 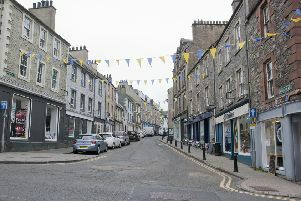 Our design team has been working with officials from Scottish Borders Council to ensure proposals are fully compliant. “Research has found that the development of 28 new homes will bring in an additional £760,000 of residential spend on local shops and services, a £1.1m spend on suppliers, and the creation of approximately 120 jobs. “Furthermore, the Croft will ensure that the pressure on the housing land supply is reduced and the provision of choice across the housing market area is increased through the design, quality and density of development that can be achieved.